Never has there been a greater earthly hero in Western culture than King Arthur. Supposedly living in the 5th century, it wasn’t until 1136 when a monk, weaving in common tales, wrote down his story. Thereafter, every era has created it’s own King Arthur: Henry VIII believed himself to be the reincarnation; in Austria, Emperor Maximilian’s tomb includes a prominent Arthurian statue; and in South Tyrol, the Runkelstein Castle is decorated with Arthurian frescos. For centuries, people in Glastonbury, Somerset believe the legendary island of Avalon to be the final refuge for the wounded Arthur. Here, pilgrims gather at a summit, form a circle, sing and meditate beside a bell tower, believed to be the entrance to the Celtic underworld. Near Stonehenge, John Timothy Rothwell considers himself the legitimate descendant of the mythical ruler, renaming himself Arthur Pendragon. John Timothy Rothwell, an English eco-campaigner and neo-druid leader, is the head of a group of lay knights and considers himself the legitimate descendant of King Arthur. At the autumn equinox he gathers with Arthurian friends at Stonehenge to perform a ritual. Glastonbury, England. 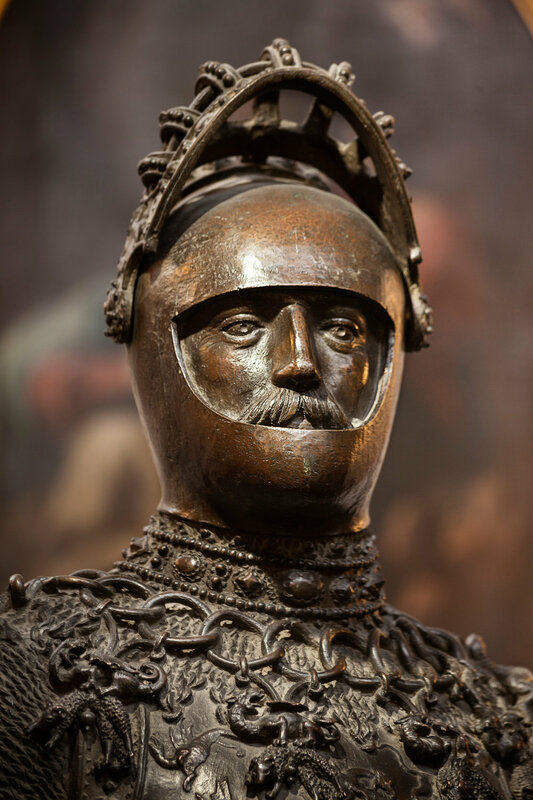 A bronze statue of King Arthur, legendary king of the 6th century Britons, is located in the Royal Chapel at Innsbruck, Austria, on the grave of Emperor Maximilian I. The cast was created by Peter Vischer the Elder in 1513 according to a design by Albrecht Dürer in 1509. Innsbruck, Austria. Legend says King Arthur was conceived in Tintagel castle high above the Atlantic Ocean in Cornwall, the illegitimate son of Uther Pendragon and his mistress Igerne. Archaeologists found evidence of trade in the medieval castle dating back to the 5th century, suggesting it was the main settlement of Cornish kings. Tintagel, England. Located in the vicinity of Tintagel Castle, made famous by Tennyson in his Idylls of the King, and only accessible during low tide, Merlin’s Cave is an important site for the Arthurian myth. The cave is still very atmospheric, and when famous guide Tor Webster - with his staff and torches - leads a group of tourists through the cave, one might imagine Merlin approaching. Tintagel, England. 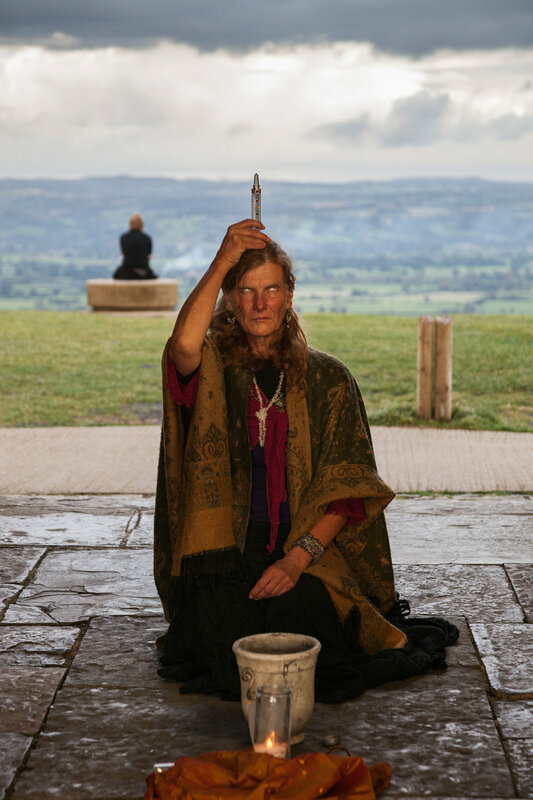 A woman performs a ritual inside the bell tower on Glastonbury Tor, believed to be the mythical entrance to Avalon, the land of fairies. For centuries, people in Glastonbury believe the legendary island of Avalon to be the final refuge for the wounded Arthur. Glastonbury, England. Millionaire Frederick Thomas Glasscock founded the Order of the Fellowship of the Knights of the Round Table and intended to save the world by promoting Christian ideals and Arthurian notions of medieval chivalry. He commissioned “King Arthur’s Great Halls,” which opened in 1933, with stained glass windows illustrating Arthurian tales, and a replica of the king’s magical sword “Excalibur." Tintagel, England. Only the spire of medieval St. Michael’s church remains on Glastonbury Tor, the entrance to Avalon – a mythical place where the legendary king awaits his return into this world. The Tor has been identified with King Arthur since the alleged discovery of King Arthur and Queen Guinevere's coffins in 1191 in nearby Glastonbury Abbey. Glastonbury, England. Henry III added the Great Hall to Winchester Castle between 1222–1235. An Arthurian Round Table constructed in the 13th century and later repainted by Henry VIII, is on display there, depicting him akin to his great idol with the names of the legendary ruler’s knights inscribed around the table. To this day, Arthur’s characteristics and ideals have lost none of their appeal to rulers and potentates – and to tourists. Winchester, England. Runkelstein Castle in Southern Tyrolia is home to one of the largest preserved fresco cycles dating back to the Middle Ages. Among them is a series on “Garel of the Flowering Valley” that is closely connected to Arthurian myth, commissioned around the year 1400. Innsbruck, Austria. Members of the Cornwall based group Kernow Levy re-enact a battle: No battle was ever lost by King Arthur until he and his son Mordred faced one another in Slaughterbridge along the Camel River. Mordred was killed in the battle, while heavily wounded Arthur was brought to Avalon, land of the fairies, on a boat. Tintagel, England. Tintagel Parish Church, dedicated to St. Materiana, is only a short walk from Tintagel Castle where myth says King Arthur was conceived. The first church is thought to have been built there in the 6th century, while the current one dates back to the late 11th or 12th century. Tintagel, England.